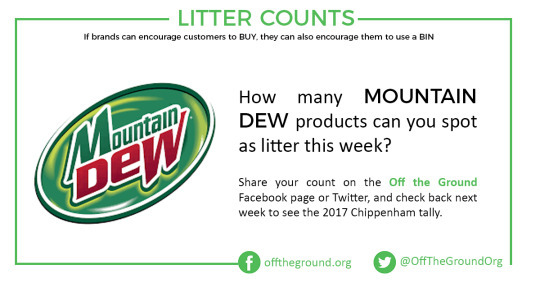 It’s easy to see small tallies like this and perhaps think that litter from water bottles isn’t a big deal. 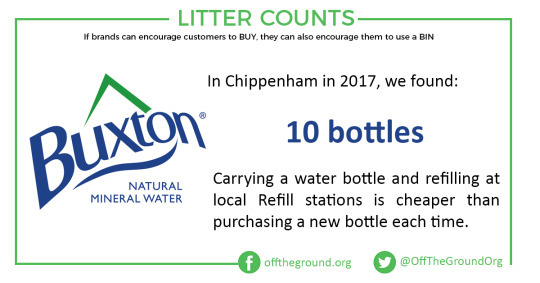 However, Buxton is just one of 78 different types of bottled water we’ve found in Chippenham. Not only that, but plastic bottles are the biggest category of unknown litter: the labels from water bottles fall off easily, so the real number is likely far higher. I would love to see packaging redesigned to prevent this from happening; one piece of litter is bad enough, but detachable labels create two. Looking ahead to this week, I imagine that large multinational companies spend a small fortune on their branding and design to ensure that the colors, typefaces, and logos send just the right message to their target audience. This care and attention means that the big brands can be easily identified at a glance, whether it’s the red-and-white scroll of Coca-Cola or McDonald’s golden arches. The flip side of this brand recognition is that it is very easy to see which products end up dropped in our communities, discarded along roadways, and washed up on the coasts. For this reason alone you would think that companies would want to send the message that they are opposed to litter, whether by including a message in their general advertising or a specific campaign. While it is not the companies that cause the litter, the behaviour of their customers reflects back on them. One of the easiest brands to spot is Mountain Dew, whose luminous green bottles practically glow like nuclear waste along motorway verges. This is the product to watch out for this week, and take guess how many we found last year.